If this was your reaction too, read on. You probably don’t need to freak out. The International Agency for Research on Cancer, part of the World Health Organization has released a report stating that processed meat is carcinogenic to humans and that red meat is probably carcinogenic to humans. The Cancer Research of UK has a great article highlighting the difference between evidence and level of risk. This infographic highlights how much the level of risk differs between tobacco usage and meat consumption. 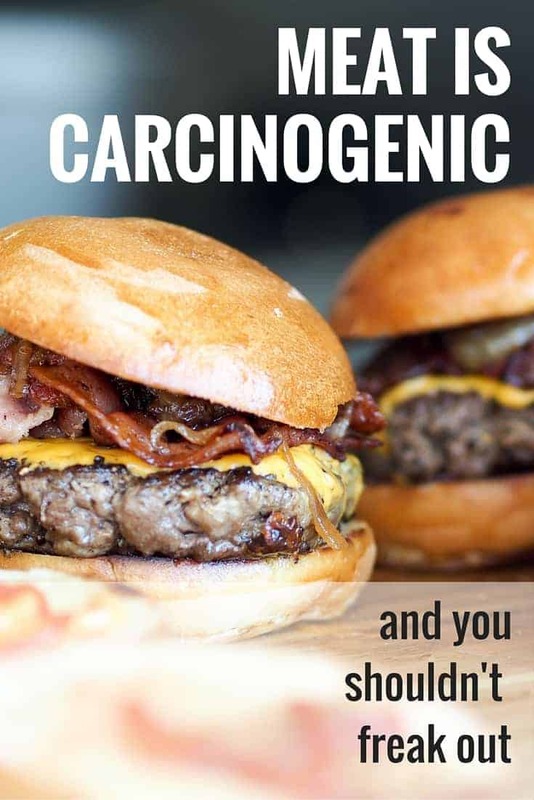 Why is Red Meat Considered a Carcinogen? One of the suspected reasons red meat increases the risk of cancer is the presence of heme, which gives the meat it’s characteristic colour. Heme is a component of hemoglobin, a protein found in the blood that contains iron and transfers oxygen to the body’s cells. Based on my knowledge of human physiology, here’s my interpretation. The human body’s capacity for iron absorption is dependent on the body’s need for iron. If a person is low on iron or has a higher requirement (such as during pregnancy), the body will increase the rate of absorption. If a person’s iron stores are adequate, only a minimal amount of iron will be absorbed. The rest will travel unabsorbed through the small intestines to the colon. This is where too much iron can cause problems. “Bad” gut bacteria thrive on iron. Excess iron feeds the bad bacteria. Iron can cause oxidation, which leads to inflammation. So, you want to avoid getting too much iron. Eating plant-based foods will accomplish that. But for those who NEED iron, a little meat can be an important part of their diet. Iron deficiency is also a serious cause for concern. Iron deficiency anemia reduces quality of life by causing extreme fatigue, brain fog, and lacklustre skin, hair and nails. So adult men are the ones who really need to watch their meat intake. Unfortuately, they are typically the highest consumers of meat. If you eat processed meat everyday or several times a week you should be cutting down. If you eat red meat everyday you should be cutting down. If you eat a large quantity of meat in one sitting, you should cut down your portion size. In general I feel that most omnivores in Western countries could stand to lower their meat intake. If you’re curious, I have 9 good reasons for the call to eat less meat. People often want to know what Dietitians themselves eat. Well, my family is flexitarian. Our diet is mainly plant-based, but we also enjoy meat, poultry, and fish about three times a week. On those occasions, the meat is in small portions. From my education and reading of the scientific literature, I firmly believe that this is a healthy, balanced way to eat an omnivorous diet. I also believe that vegetarian and vegan diets are healthy as well, so I fully support my friends, family, and clients who choose to eat this way.